Like most map nerds I love these map comparison websites. GeoFabrik's Map Compare allows you to view several OpenStreetMap layers side by side with different Google Maps map types. The two maps are synchronised so zooming or panning one map will zoom or pan the comparison map. Geofabrik is the work of two active German OpenStreetMap contributors, and the Map Compare tool was developed to allow Geofabrik to compare OpenStreetMap map offerings to Google Maps maps and aerial imagery. 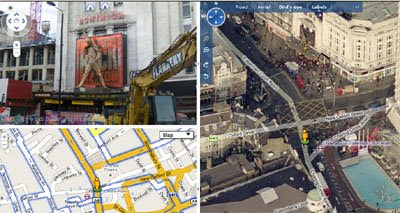 GeoTrubu also has a comparison of Google Maps and OpenStreetMap and also shows Yahoo Maps. The site allows you to select the base layer for each map. Just like Map Compare if you pan and zoom one map the other maps will act in synchronisation. Sautter.com have a different way to compare OpenStreetMap and Google Maps layers. This map overlays OpenStreetMap on top of Google Maps and includes a transparency slider so that you can adjust the transparency of the OpenStreetMap layer. Where is the Path displays Google Maps alongside the corresponding Ordnance Survey Maps. 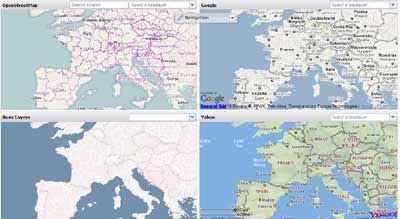 Dual Maps is a map creation tool that allows anybody to make an embeddable map that includes a Google Map, a Google Maps Street View and a Virtual Earth Bird's Eye view of the same location. This map places Bing Maps' Bird's Eye View side by side with Google Maps' new Aerial View. It shows differents kinds of layers also.